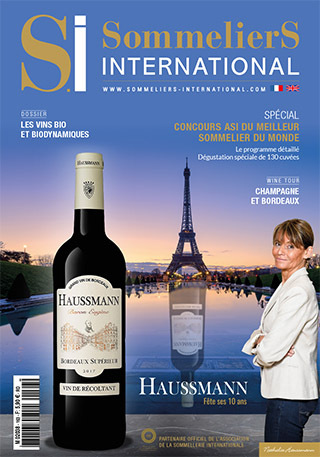 Best Sommelier of France 2018, appointed Personality of the Year by RVF in 2019, Pascaline Lepeltier declares: “I see myself as a symbol of the need to think about what we drink, what we eat. what must be done to stop slaughtering the soil, and try to be the driving force to transform all agriculture” and says she is “delighted” by the “movement” initiated by prestigious vineyards towards organic and biodynamics. This reflection on the craft, on viticulture, which could have gone unnoticed within the cosy world of the sommellerie, confirms the consideration by professionals of the profession of a real change among these prescribers. It seems to tell us, in the wake of Alexandre Morin, former sommelier of Chapon fin, that consumers are now clamoring for a sign of the profession and that they are ready to integrate a substantially ethical dimension. Both sommeliers and wine merchants will not be able to avoid pedagogy at the risk of making this change completely illegible. AB labels, HVE labels, biodynamic certifications, notions of ‘integrated’ or natural wine end up blurring the discourse or, even worse, refer to totally opposite views of viticulture. Among the labels that guarantee this return to the truth, we will retain, give credit where credit is due, the AB label. The production of organic wine is governed by a European regulation–the same everywhere. The abbreviation AB for Organic Farming [Agriculture Biologique] is an official sign of quality identical to the AOC. This label belongs to INAO. The affixing of the AB logo is optional whereas the use of the Euroleaf is mandatory. Certified organic farming goes without chemical fertilizers, chemical weed killers and synthetic chemicals. It proscribes GMOs. It involves a conversion time of 3 years as well as the subjection to an annual control carried out by certification bodies approved by the State. Production rules include the winery since August 1, 2012, implying that the entire process is regulated: grapes and winemaking. • France had just over 5,800 certified wine estate in 2017 for almost 79,000 hectares, or 10% of the French vineyard, compared to just under 15,000 hectares in 2007. • Since 2012, organic wine sales have doubled in France with an average annual growth of 20% since 2010. • Households spent 670 million euros in organic wines in 2017. • The market share of organic wine in France is 3.72%. The figure is expected to rise to nearly 8% in 2022 (Sudvinbio 2018 survey). • 46% of the organic wines are exported compared to 30% of the so-called conventional wines. • The average selling price of a bottle of certified organic wine is 8.70 euros compared to 6.90 for a classic bottle (Ipsos survey). Organic farming is therefore limited to the use of natural substances, such as copper, sulfur, plant and mineral extracts. It recommends the incorporation of green manures, vegetable or animal composts. It advocates the improvement of soil fertility through mechanical work and defends a coherent and balanced ecosystem. Concerning winemaking, the AB label imposes 100% organic inputs (e.g. yeasts) and advocates the prohibition of certain physical processes, such as dealcoholization. Its specifications also restrict the list of oenological aids and limit the dosage of SO2. Winemakers who are not inclined to tolerate the addition of tartaric acid, exogenous yeasts, chaptalization or reverse osmosis, all of which are tolerated by the AB's specifications (1), will venture on the steeper paths of biodynamics. This practice is framed by private specifications, such as Demeter or Biodyvin, which accompany around 500 wine estates throughout the country. Largely based on the Rudolf Steiner’s precepts (2), biodynamic viticulture aims, in general, to rehabilitate, boost and intensify organic life in the vine’s environment. This approach consists, by natural means, to intensify the exchanges between the plant and its environment: soil, humus, roots, leaves, even the lunar cycles are taken into account! Involving, biodynamics require that its followers have a perfect understanding of the biotope, grass cover, flow of sap, astral cycles ... An expertise that finally sends to oblivion the image of a non-interventionist winemaker. There are some other certifications inclined to follow the path of a little more virtuous agriculture. Terra Vitis is an environmental certification recognized by the Ministry of Agriculture. Its breakthrough with wine growers is still rather marginal and they will sometimes favor the mention HEV. The latter is supervised by the French public authorities and allows a ‘farm’ certification. The specification of the mention ‘High Environmental Value’ covers the entire farm. The farmer commits here to extend his sustainable practices to the entire farm, taking into account all the natural areas that it encompasses. We must mention the Bordeaux collective approach of the Environmental Management System [SME]. SME is intended for operators who wish to reduce the impact of their activity on the environment. It takes into account all the company's activities and involves all its stakeholders: employees, associates but also partners and service providers. The Terra Vitis, HEV or SME processes can be likened to a rational wine-making behavior but they do not prohibit the use of CMR substanes (3) or chemical inputs. Less virtuous than organic certifications, they enjoy, especially among the general public, much less notoriety than the AB certification, recognized by 78% of the consumers! Pour un tour d’horizon complet il nous faut aborder la question des vins natures ou naturels, qui semblent avoir souvent effectués une OPA sur les caves parisiennes. Ces dénominations brouillent parfois un peu les pistes dans la mesure où nulle réglementation ou certification officielle (4) viennent l’encadrer, laissant finalement dans l’expectative bon nombre de prescripteurs, cavistes ou sommeliers. For a complete overview we have to address the question of natural wines, which seem to have often made a takeover bid on Parisian wine shops. These denominations sometimes confuse the tracks a little since no regulation or official certification (4) come to frame it, finally leaving in uncertainty many prescribers, wine merchants or sommeliers. If the mention ‘natural wine’ is prohibited on the label by the General Directorate for Competition Policy, Consumer Affairs and Fraud Control, some specifications, for example AVN or Dynamis, frame the production of natural wine by proposing to elaborate wines without additives, with the least possible sulfur or according to biodynamic principles, by using for example the sensitive crystallization and volcanic sulfur. It is therefore not possible, as itis often the case, to limit its definition to vinification without added sulphites. With a bit of provocation we could say that it is a question here of making wine only with grapes. As Alexandre Morin explains: “The term 'natural wine' does not necessarily have a good reputation because the tasting approach is quite different compared to wines stemming from ‘classic’ winemaking. In my opinion, a lot of pedagogical work has to be done. There is enough room for “nature” in the mondovino!”. Copper: a beam in the eye of the conventional winemakers? The absence of synthetic inputs does not exclude the use of sometimes controversial products. Thus copper is used in organic farming to control fungal diseases. This is especially–that is the problem–the only active ingredient with fungal effect, approved in organic or biodynamic farming. The repeated use of copper in the fight against mildew is the main source of copper pollution in agricultural soils, in which copper may represent values between 100 and 500 mg/kg against 3 to 100 mg/kg in natural soils. The real effects are controversial and the microbiologists Lydia and Claude Bourguignon relativize the impacts by explaining that copper is much less toxic than synthetic products. Above all, they remind us that life remains more active and abundant in organic plots whose more aerated soils allow for greater degradation of copper. The environmental effects and its overconsumption motivated the last regulatory restrictions. Thus, if the use of copper for phytosanitary purposes remains allowed in conventional and organic agriculture, it is now limited to 4 kg/ha/year, smoothed over 7 years, against previously 6 kg/ha/year over 5 years. The specifications of the biodynamic sector allow a cupric intake of 3 kg per year and recommend in the first place the use of natural defense stimulators or physio-fortifying. In the preface to the book “The Taste of Pesticides”, Nicolas Joly was moved by the existence of corrupted wines, without soul and without conscience: “One never tastes wondering if it is true. The truth of taste, which was the basis of a controlled appellation of origin, has been totally destroyed by legislation and modern agriculture”. Regarding organic or biodynamic wines, what taste are we talking about? The obsession of biodynamists and some organic producers is to craft wines totally representative of their terroir and to guarantee the development of wines from absolutely healthy and resistant grapes. A living soil, an endogenous meadow, late and soft pruning, indigenous yeasts are the keys to succeeding in making sincere wines. Organic wine makers or biodynamists celebrate a newfound taste, which will be called “right”. It should be noted that these winemakers almost invariably question the importance of industrial yeasts, oenological practices but also containers masking the “original” taste of wine, or for that reason the passion of Roland La Garde in Blaye, the Capelanel estate in Cahors and other virtuous winegrowers for other containers. This category of wine makers remains convinced that only wines made from healthy grapes will be revealed without difficulty by the amphora or the cement tank! In biodynamic terms, as Michel Baucé of Château Pré La Lande reminds us, there is a gain in maturity of the grapes that does not undermine the freshness of the wines. These winemakers, who we will call virtuous, are now reshuffling the cards, they invite us to look at the very process of making a wine, to take an interest in the biotope, where for a long time our vision of the wine stopped at the cellars. It is right to think that this viticulture has the mission of never making us forget the grapes, the soil and the vine, in this it has put things right. (1) A recent amendment of the European regulation extends the list of inputs. (2) Rudolf Steiner, founder of anthroposophy and mastermind of biodynamics (1861-1925). (3) Chemical agents that have, in the medium or long term, carcinogenic, mutagenic or toxic effects for reproduction. (4) The European Union is working on a set of specifications which would mention the prohibition of filtration, fining, selected yeasts and would require AB certification. Prepared in decoction, horse tail strengthens fungal preparations to stimulate the defenses of the vine against mildew. Rich in silica, horse tail applied after decoction strengthens the cells of the vine leaves to cope with mildew. Experiments conducted in the Jura Viticulture Society show the interest of horse tail in delaying the maturation of eggs, from 3 to 13 days according to the tests carried out between 2011 and 2013. It also limits their germinal potential. The preparation will be applied at bud burst on the ground, or associated with anti-mildew. Consumers and organic wines: natural on both sides! Good news for the French wine industry, though we have become occasional wine consumers, young people and lovers of proximity distribution channels are more and more interested. But for (almost) all these consumers, the “natural” nature of the wine raises questions. The wine, while being of quality, must be artisanal, close and respectful of its soil. A label carrying an organic logo reassures, “it is beneficial for the environment and good for the producer”. And sales follow! They are up 25% in 2018 even though they represent only 2% of the total wine purchases in France, with organic wines present in all distribution channels. Paolo Bouca Nova, commercial and purchasing director at Le Repaire de Bacchus (41 wineries in Paris and the Parisian region), confirms. 15 to 20% of his range are organic wines and this share will continue to grow. This offer is no longer, as in its beginnings, presented in an organic section but dispersed with traditional wines and identified with a collar on the bottleneck to differentiate it. His customers come first to buy wine and the organic label is a plus. Only the well-informed connoisseurs seek to find the most authentic taste of the raw material, that of the grape and the soil and will be able to be interested in the so-called natural wines, still little comprehensible. On the Twil app (The Wine I Love)–you scan the label with your cell phone, you twil and you get directly in touch with the producer–6,000 organic bottles have been sold in 2018 including Alsace, Loire, Languedoc-Roussillon and Rhône Valley. At BiboVino, a specialist of bag-in-box wines, almost half of the wines are organic wines and the demand continues to grow. More and more customers, especially women and under 40, come for organic and put forward a more pleasant ‘easy-drinking’ character of these wines. Same thing at Sopardis, another specialist of bag-in-box wines. Antoine Pujol-Dorey, manager of the Cave d'Antoine wine shop (3 shops in Bordeaux), is 80% organic with entry-level wines at €5 to €6 in white and red and a core selection between €8 and €12. He even proposes ten biodynamic wines around €7. When he opened in 2010, 50% of his offer was organic. Organic is consumed “for what it represents, a product without chemistry or very little”, not for a particular taste identity. Antoine provides some fifteen restaurants and notes that the organic offer is part of the renewal of the restaurant business. For Alexandre Morin, sommelier consultant in Bordeaux (Le Vin l'Emportera): “The demand for organic wine is real in catering. If the AB logo is affixed to a reference in the wine list, sales are multiplied. And yes, the customer is willing to pay 15% more”. Beware, however, of the banalization of the speech of some sommeliers not always precise when they speak of organic wine. For Alexandre, information is needed especially around the new certifications like HEV, SME ... At TN'Bar in Bordeaux, Maxime Lorcelet, its director, chose from the opening in October 2018 to offer only French, Spanish and Italian wines, “at least organic, and more genrally ‘natural’” to meet customers always more concerned about what they consume. 2019 should confirm this underlying trend for ever more "naturalness" with an even more diverse offer by responsible producers for demanding and environmentally conscious consumers.